Last night’s post about Eric Thompson’s silly NZ Herald article highlighted one unresolved matter – the question of “what is Auckland’s population density?” I noted that according to Wikipedia, the urban density of Auckland is around 1250 people per square kilometre whereas Demographia states a density of around 2,200. I had to dig a bit deeper. Once we recognise that we’re talking about the population of urban Auckland rather than the whole of what might be called the Auckland “region”, the population part of working out Auckland’s density is relatively settled. Furthermore, the “error” is pretty small when comparing statistical area, metropolitan area and urban area, because not too many people live right on the edge of the city in places that might fall one way or the other. Where we see big differences is in the area of land taken up by parts of Auckland on the edge of the city that may not yet be urbanised, but fall within the urban statistical area or within the metropolitan urban limits. These areas are quite large in physical size, yet contain very few people – so can throw out our density measurements for the rest of the city. The map below (from here) is useful in highlighting the different spatial extents we can use when trying to calculate Auckland’s population density: The different boundaries obviously provide us with different “sizes” for Auckland, when measuring population density. My feeling is certainly that the “urbanised area” is what’s most valid when talking about “Auckland’s population density” – particularly in terms of discussing whether the city’s density is too high, too low, supportive or unsupportive of different transport options and so forth. The urbanised area is the smallest of all, followed by the metropolitan area (the MUL) while the statistical urban area includes the rural parts to many Census Area Units that partly fall within the urbanised area. Obviously the region as a whole is the largest area of the lot – and is predominantly (by size) rural. These different area extents lead to quite a wide variety in outcomes when we start to measure population density: Leaving aside the region’s density, we can see that there are still huge differences between – for example – the density of the ‘statistical urban area’ and the density of the ‘urbanised area’. Those rural parts to the census area units end up making an enormous difference. There’s not too much difference between the density of the metropolitan area and the urbanised area, presumably because most land within the urban limits has been urbanised. Overall, it seems to me that the most accurate measurement of Auckland’s population density is 2,395 people per square kilometre (in 2006). Interestingly, this is a much much higher total than Australian cities such as Perth and Brisbane – similar to Sydney and higher than Vancouver. 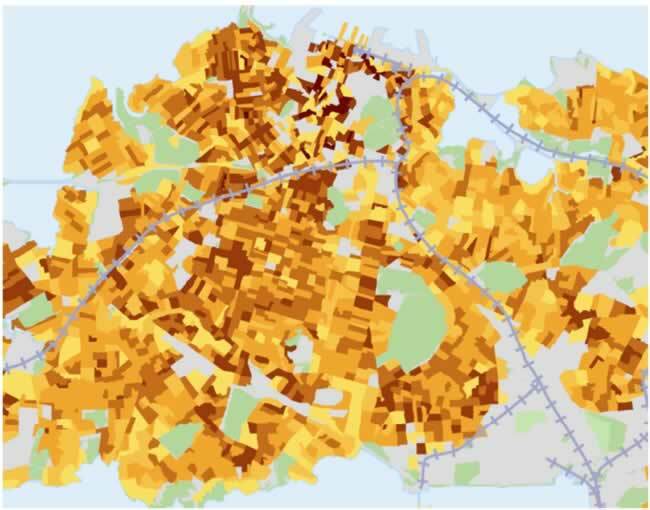 If we look within Auckland’s urban area, there’s quite a variety of population density. Obviously densities are highest in the city centre and its immediate surrounding suburbs – because that’s where apartments are provided (and allowed). But even looking across just a part of the Auckland isthmus there seems relatively little pattern – at first glance – to many of the density results. The darker the colour the higher the density (map from here): However, if you start to fiddle around with the numbers to average out a few of the highs and lows – as was done in this report – you can start to see a few more obvious patterns: I’ve never quite seen Auckland’s density presented in this way before and I think it’s actually pretty damn useful when taking an overall look at the city’s structure. A greater number of ‘gradations’ would be useful to look at, particularly within that giant blob of the central-west isthmus. Debates over Auckland’s population density will probably continue to rage forever, but hopefully this post may shed some light on the matter. Thanks for the link – weighted density is a great idea, hadnt thought of it before. 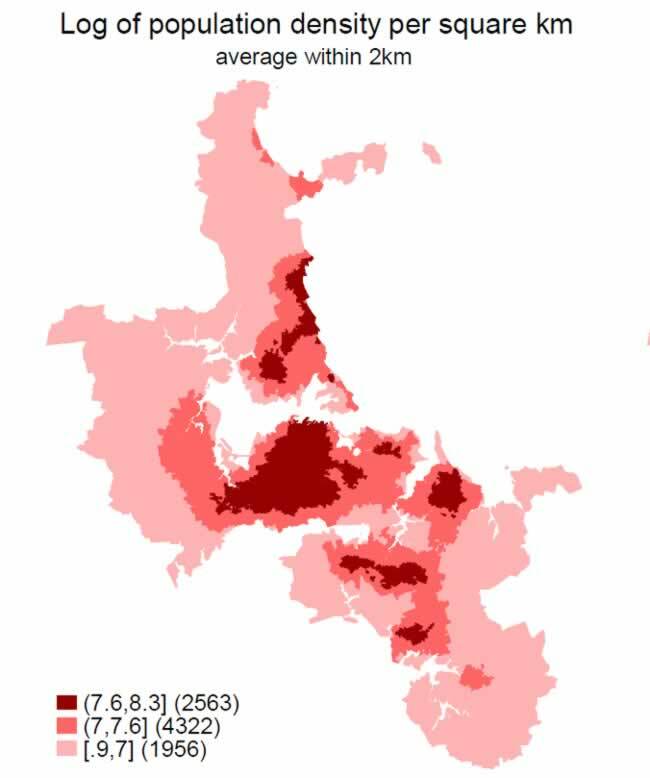 Weighted density can do explicitly what admin has done intuitively – discount the rural area because of the very small part of the population that lives there. In the case of auckland you could take a simple example of only 2 areas to be weighted (similarly to the example in the link). The 2 areas can be the urbanised area and the rest of the region. Weighted density = (2395*1156623 + 32.4*146445)/1303068 = 2129/km2 so still very close to the urbanised area density. Discretising the calc further would probably lead to a higher density still. Since before I was a planner I have heard people quote various stats about Auckland and give reasons why the transport is the way it is. Along the lines of being the worlds most (or second behind LA) spread out city, low density city, car dependant city etc. I even heard John Banks say at a conference 3 years ago that Auckland was the worlds 2nd most spread out city. You have probably heard similar myths as well. The truth is Auckland and greater Auckland is an average city in both geographical spread and density. A little research can easily find cities that are better and worse than Auckland in most categories. I generally don’t like density as a measurement for determining if PT will be successful in a city. In the past it has beena massive excuse for why PT was not successful in Auckland. 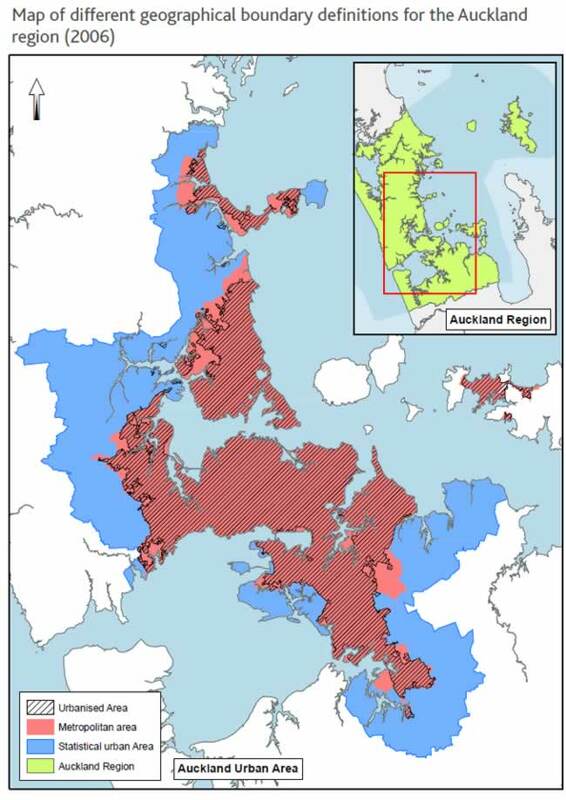 Claims of Auckland is not dense enough for PT. But as shown I this post the density all depends upon the land area used in the calculation. Density of international cisites is usually inconsistent in what is counted in or out of the city area, especially on Wikipedia! Ive come to the conclusion that density is only used because it is a very easy measure to generate. Just take 2 numbers and divide them…. In the end PT is usually deemed successful or a failure depending upon the number of people that use it. So perhaps measuring the % of people in a statistical area that use PT is a better measure. That also gives a more realistic goal of how to improve PT. I think its more realistic for planers to say, what can we do to get 300 more people in this mesh block to use PT, than to say how do we raise the density up to 5,000 people per Km2. The other interesting thing to measure is the density of the area served by public transport. I know its worthy of its own post, but density along PT corridors and how density is structured seems like something more worthy of measuring and worrying about. PBY those are good points. Density is a pretty crude tool. I have been using GIS centrality software to analyse “betweeness”. This actually tests a place’s inherent accessibility. For reference here is a simple network analysis that shows more connected places in red. The lines over it are the historic tram lines. It’s no surprise that the places along historic tram lines are more accessible since the economic viability of the tram lines (and the second ring suburbs) where geographically dependent on it. This analysis is closely related to mthe discussions on how some density is better than others: small blocks, multiple intersections, lack of barriers, etc. One of the best uses of this software is to test particular PT station’s centrality (basically a catchment tool). An example of how it could work would be to analyse each station’s ability to capture increased ridership by integrating cycling infrastructure and amenities at stations. The tool would be able to quickly evaluate the potential catchment difference of each station by comparing a 500m to 2km range. The stations with the biggest potential audience would receive the bike storage lockers and improved on-road facilities, etc. Could Wikipedia be updated now? Patrick- Can you do it, or show me how? I have never worked out how to add citations on Wiki. No idea Geoff, never done it… anyone? Easily done – I can cite this blog and the original paper that admin has cited. I think it is fascinating to see how the density in the North Shore is distributed. It’s the only area of Auckland where it doesn’t really follow the pattern you would expect. Like in the isthmus the density is closest to the CBD, which makes sense. Then in the West that high density patch seems to encompass New Lynn and Henderson. And in the South and South-East you can see little emerging density patches around their town centres. You’d think that either the bits in the urban centres in North Shore (Takapuna, Albany)or the bits that are closest to the CBD (Devonport, Northcote) would be densest. But instead it’s in a kind of irregular swatch up the middle of the Shore and then along the coast. Is that because it is the only part of Auckland which grew without any public transport at all to start off with do you think?